BOSTON – Monday, December 12, 2016 – Mayor Martin J. Walsh today announced a new partnership with Boston University and Project Place as part of an ongoing effort to improve the neighborhoods around the Melnea Cass Boulevard and Massachusetts Avenue intersection through targeted investments in beautification, public safety and enhanced homeless and addiction recovery services. The neighborhood will be cleaned five days a week by Project Place, an area non-profit that provides employment opportunities for low income and homeless individuals. 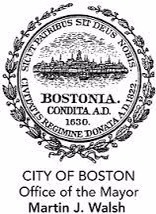 Over the summer, Mayor Walsh convened a group of City departments to better coordinate City efforts around the intersection of Melnea Cass Boulevard and Massachusetts Avenue. As one of its core goals, this group is focused on ensuring the streets are well-maintained, including more consistent cleanup, landscaping and public art. With its Medical School campus in this neighborhood, Boston University immediately stepped up to assist with this effort. The Project Place’s Clean Corners Bright Hopes program has dedicated more than 75 hours a week to act as ambassadors in the area around Melnea Cass Boulevard and Massachusetts Avenue. This work includes picking up litter and discarded syringes, maintaining planters at the intersection of Massachusetts Avenue and Southampton Street, and acting as a friendly face for visitors to the neighborhood. Continuing to work on beautification is one of the City’s top priorities. In addition to Project’s Place work to clean the neighborhood, Mahoney’s Garden Center has provided flowers at reduced cost. Project Place is acting as an important supplement to other critical City services, which have been enhanced in the neighborhood surrounding Melnea Cass Blvd. and Massachusetts Avenue. In addition to Project Place’s efforts, four individuals from the Boston Public Health Commission’s Outreach Team work seven days a week providing outreach to individuals in the Melnea Cass Boulevard-Massachusetts Ave neighborhood. They engage with approximately 400 people in the neighborhood each week, assisting about 10 percent of those engaged in accessing treatment and helping those once barred from a shelter to regain admission and get the support they need.